Advent Day 23 :: Go see Santa at the mall, originally uploaded by earthchick. I have never taken my kids to see Santa at the mall. The whole thing just bothers me – the crowds, the wait, the mall. I really don’t like going to the mall, and if I do go, I prefer to go alone, dart in and get exactly what I need, and get out. If you had seen the three of us at the mall yesterday, you would have thought my kids led very sheltered lives – they were oohing and aahing at everything: the way the mall was decorated for Christmas, the trees everywhere, the lights, all the giant Christmasy animals, the escalators in the department stores. O hai, we don’t get out much. They did get to sit in Santa’s lap at a Parents of Multiples holiday party when they were babies and then again when they were 3. But they’ve never done the whole mall Santa thing with the professional photo and everything. Little Buddha express some interest this year, so I thought we’d give it a go. They were very excited to pull this activity out of the calendar. Turns out that December 23 is a pretty good day to go see Santa at the mall, because the line is almost non-existent. But the pictures? Well they were not good. Certainly not worth $20+. (And of course they won’t let you take your own). They couldn’t get a shot with both boys looking at the camera at the time (and as you can see above, I can’t always get that right either. OTOH, I’m not charging anyone $20 for this shot, and if I were, I would take the time to get a shot where both kids were looking at the camera). Anyway, the guy at checkout suggested we go through the line again to get a better shot, but when I tried, Tiny Dancer started crying. He didn’t want to do it again. And I knew it was over then – we might get both kids looking at the camera, but one of them would be pouting. 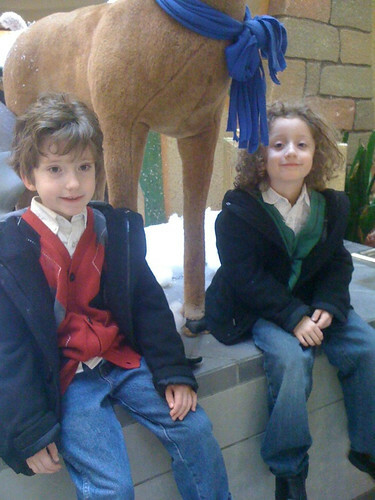 So I took a shot of them with the mall reindeer instead, and then we got cookies and Icees. We topped off the adventure by riding the escalators in Von Maur. So even though we left without pictures, we all had a good time.